This all-purpose clutch is for makeup lovers and fashionistas alike. Made of a durable canvas material, this bag can store anything from your favorite lipstick to your smart phone. 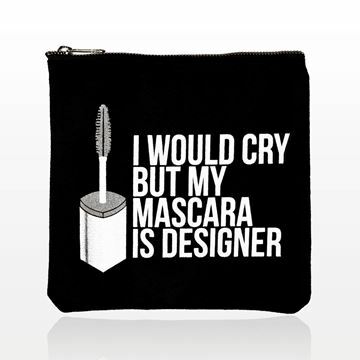 This clutch is made with a black canvas material and is screen printed with the trendy mascara logo and quote "I WOULD CRY BUT MY MASCARA IS DESIGNER." It comes with a silver metal zipper. The interior fabric is a vintage print material accompanied with the Breakups to Makeup logo. This is not your ordinary makeup bag! This all-purpose clutch is for makeup lovers and fashionistas alike. Made of a durable canvas material, this bag can store anything from your favorite lipstick to your smart phone. 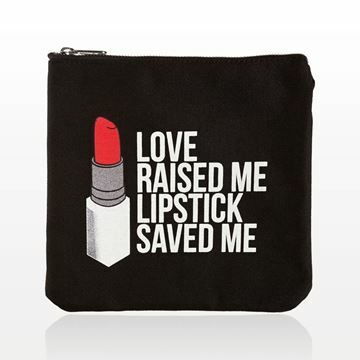 This clutch is made with a black canvas material and is screen printed with the trendy lipstick logo and quote "LOVE RAISED ME LIPSTICK SAVED ME." It comes with a gold metal zipper. The interior fabric is a vintage print material accompanied with the Breakups to Makeup logo. This is not your ordinary makeup bag!